If trying to maintain balance in your life makes you feel like a tightrope walker, you’re not alone. 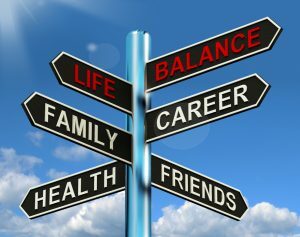 When we have many demands on our time and energy, life balance can get out of control. Quickly! Take this quiz to see how well you are meeting your responsibilities, while also recognizing and fulfilling personal wants and needs. Answer true (T) or false (F). T F 1. I successfully manage my life by taking care of myself physically and emotionally. T F 4. I get check-ups, go to the dentist and take preventative precautions. T F 5. I set aside enough personal, quiet time for myself. T F 6. I experience the gifts of each season, such as skiing in winter, gardening in spring, going down the Shore in summer and leaf-peeping in the fall. T F 7. Creativity nurtures me. I do what I love, whether that’s cooking, drawing, painting, writing, dancing, singing or other creative pursuit. T F 9. Contributing to the world provides connection and purpose, so I give my time, energy and experience to worthy causes. T F 11. If I feel that I’m catching a cold, I realize I may have stressed my immune system so I stop and take care of myself. T F 13. I listen to and honor the requests my body makes for such things as sleep, exercise, eating healthier. T F 14. If I have something planned for myself, I don’t just toss that aside when someone requests something of me. T F 15. I’m busy but I find time to do the things I want to do. If you answered false more often than true, you may want to look at the questions to which you answered false and see if you want to make some positive life balance changes. Being organized makes life much easier. Imagine no longer wasting time searching for things, living clutter-free, knowing where every single thing is located, staying on top of paperwork and to-dos, and making time work to your advantage.